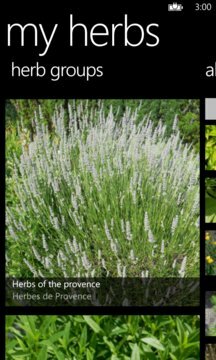 The app contains more than 50 herbs in pictures and text. The herbs are divided into different categories: culinary herbs, herbs de Provence, tea herbs, medicinal herbs, attractive herbs for decoration and of course all herbs by alphabet. You get a fast, dedicated access to the world of the herbs. For each plant you'll find a photo, a short description of its properties, such as origin, size, flowering time and color as well as tips for harvesting. You'll also find notes if the herb can be used in the kitchen and its healing properties. 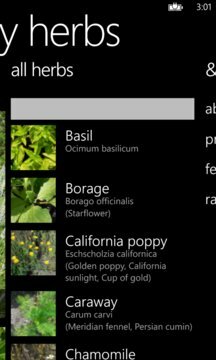 The app also contains some nearly forgotten ancient herbs. The differentiating aspect of the app is that it makes it very easy for you to get more information on each herb because it contains intelligent links to the Internet. Thus you'll get many pictures or background information about the herbs with just one click.